Zdenko Tomanovic told reporters Mr Milosevic had complained of "strong drugs in his system only used for treating leprosy or tuberculosis". Dutch TV cited an unnamed source saying such traces were found in his blood. 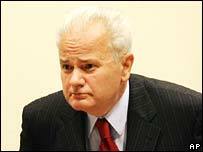 Preliminary results from an autopsy carried out on Mr Milosevic on Sunday are expected at 2115 GMT. A Serbian doctor observed the autopsy. Mr Milosevic died on Saturday and had been suffering from heart problems. UN chief prosecutor Carla del Ponte has refused to comment on claims that he could have been poisoned or committed suicide. 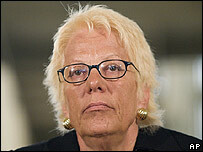 "Until we have precise results [from the autopsy] it's rumours," Ms del Ponte told journalists. Mr Tomanovic showed journalists in The Hague a copy of Mr Milosevic's hand-written letter - addressed to Russian Foreign Minister Sergei Lavrov. "He said: 'They would like to poison me. I'm seriously concerned and worried'," Mr Tomanovic said, adding that Mr Milosevic had been citing a medical report from 12 January. Mr Milosevic had requested permission to travel to Moscow for medical treatment, but the tribunal had refused, fearing that he might not return to The Hague. The tribunal also argued that Mr Milosevic was getting competent medical supervision in The Hague. Dutch public television NOS reported on Sunday that a blood sample taken from Mr Milosevic some time between November and January had shown traces of "unusual" foreign substances. The report said the unnamed drugs - which were often used to treat leprosy or tuberculosis - neutralised the medicine Mr Milosevic was taking for high blood pressure and heart problems. NOS cited an unidentified "adviser" to the UN war crimes tribunal as the source for its report. Mr Milosevic died aged 64, just months before the scheduled end of his trial for war crimes in the Balkans in the 1990s. His family blames his death on The Hague tribunal. Ms del Ponte said she expected initial results of the autopsy on Mr Milosevic on Sunday evening or Monday morning, although she noted that results of toxicology tests could take longer. She said Mr Milosevic's death made it even more urgent for Serbia to arrest the most wanted Bosnian Serb war crimes fugitives, Ratko Mladic and Radovan Karadzic. "Now more than ever I expect Serbia to finally arrest and transfer Mladic and Karadzic to The Hague as soon as possible," she told a news conference. "I deeply regret the death of Slobodan Milosevic," she said, explaining that it "deprives the victims of the justice they need and deserve". Mr Milosevic had been held at the UN war crimes tribunal since 2001. He was on trial on charges of war crimes and crimes against humanity for his alleged central role in the wars in Bosnia, Croatia and Kosovo during the 1990s. He also faced genocide charges over the 1992-95 Bosnia war, in which 100,000 people died. Correspondents say the tribunal's monitoring of inmates is under scrutiny because Mr Milosevic's death came within a week of the suicide of a former rebel Croatian Serb leader, Milan Babic. Both Mr Milosevic's widow Mirjana Markovic and son Marko have blamed the tribunal for his death. They are living in Moscow and both face fraud charges in Serbia, so it is not yet clear whether Mr Milosevic's funeral will take place in his homeland. His daughter Marija, now living in Montenegro, would also face criminal charges in Serbia. On Sunday, Serbian television reported an official statement by President Boris Tadic saying that the indictments against members of Slobodan Milosevic's immediate family were still valid and would not be lifted. Few Serbs lament the passing of Mr Milosevic and there is a debate about whether to accord him the honours befitting a former president, says the BBC's Matt Prodger in Belgrade. Serbian state television led its bulletins on Sunday with the memorial service for the reformist Prime Minister Zoran Djindjic, who was assassinated exactly three years ago. His government sent Mr Milosevic to The Hague.